In my continuing (if slightly foolhardy) attempt to visit and write about every London brewery, I arranged to visit Sambrook’s Brewery in Battersea a couple of weeks ago, and was fortuitous enough to be there on a double brew day. I was greeted by brewer Paul Brooker at 6am. Not a lot of other life about in Battersea at that time in the morning. Paul was mashing-in as I arrived, and he ran me through their setup and procedures. The brewery was founded by Duncan Sambrook in 2008 and was then amongst only a handful of London brewers. And despite the explosion of the London, and the British brewing scene in those few years, Sambrook’s beers have remained at the forefront. Wandle, their flagship beer won World’s Best Bitter Under 5% at the World Beer Awards last year. And as Gary Wilds (another Sambrook’s brewer) told me when he was brewing the second batch of Wandle later that the day, “That’s a lot to live up to!”. I have remembered seeing and drinking Wandle for many years now in pubs across London, even before my love for beer…how should I put this…intensified? So they’ve been a staple, certainly in London ale pubs, for some time. 450Kg of grain and…lots of water. Smelled lovely! My first task was to weigh out the hops. We were brewing the day’s first batch of Wandle. The gorgeous smell of Goldings and Boadicea hops filled my nostrils as I measured them out for the two hop additions. Its a very simple recipe (2 types of grain, 2 types of hops) but the end product has so much depth, complexity and smoothness. It really is a great session bitter. 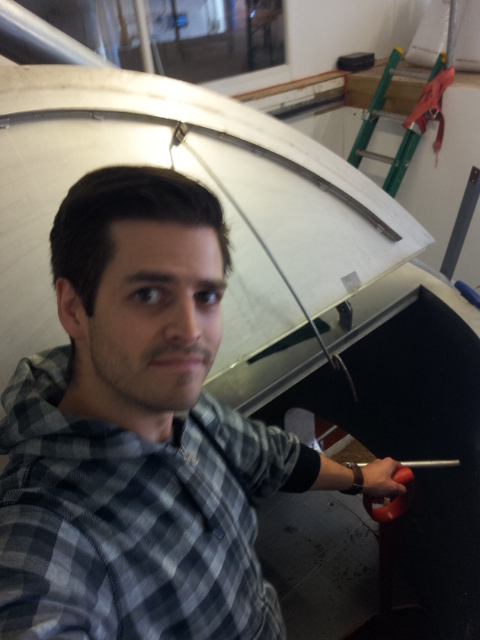 With the hops weighed out, I took the chance to peer into the steamy mash tun. As I said, this was the first brew of the day – the two brews on the 20 barrel setup would then be mixed in one of their big fermenters before the yeast was added. This shows the demand for their beers. Paul, a born Londoner, told me that he’d come to Sambrook’s about a year ago after having worked for many years at Young’s Ram Brewery in Wandsworth before it closed down in 2006, as did a couple of other staff members. However, Paul didn’t actually brew when he was at Young’s, instead he did all manner of jobs around the brewery – filling, packing, sorting, loading etc – so working here was his first experience actually brewing beer. He enjoys being a brewer and likes the satisfaction of making something that other people enjoy. By this point (about 7:30am), Jaime had arrived. She is another brewer here and she’s originally from Australia. Jaime started by volunteering a few days a week and eventually got offered a permanent position. She took me up to their lab/office to measure the gravities of the beers currently in the fermenters. She has to do it three times a day for all the beers to make sure they’re on track and the yeast are behaving. 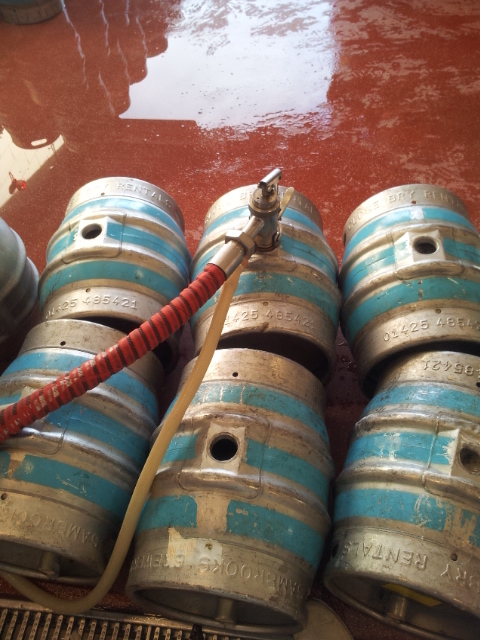 Next to arrive was Zac (yet another brewer), and his job for the day was filling casks. The brewers rotate their tasks day to day, which is needed for a brewery that needs to produce so much beer in a week. 7 brews in 5 days the week I visited. Zac is from New Zealand, he dabbles in home brewing and he’s leaving shortly to spend some time in the vineyards of France. He was racking Junction into casks and he let me have a go at filling, pouring in the isinglass and then knocking in the shives. He was far more adept at all of this than I was. And the cold weather didn’t help either, but everyone there seemed to be used to it so I manned up and got on with it. Well, I did as best I could anyway. Zac then jumped on the forklift to stack and pack the filled casks on pallets ready for delivery. In one corner of the brewery, next to all the casks, was a big stack of keykegs (disposable kegs for carbonated beers) which Sambrook’s uses for its carbonated Pale Ale – its first craft keg product. They use a technique called krausening where fresh fermenting beer is added to the already fermented beer when the kegs are being filled in order to add carbonation. Zac said that the whole process takes a lot longer than racking to casks but the end result is worth it. Paul was just beginning to sparge when I went back to the mash tun and he took a sample of the first runnings up to the lab to take measurements – gravity, temperature and pH. There are notes taken at every stage of the brewing and fermentation, sheets of figures and measurements, attenuation tests done on the yeast. This is a brewery that is focussed on maintaining a high standard for all of its beers, and keeping each brew consistent. While up in the lab I met Sean Knight, who is the head brewer of Sambrook’s. But due to him going away in a couple of days, preparing for the Battersea Beer Festival that week and having to give a tour of the brewery that afternoon, he was a busy man and and such I didn’t spend much time with him. Sean started there washing casks and moved up to brewer, and then when the previous head brewer left, he was asked if he wanted the job. And it looks like he loves the job, even if it can be quite a load sometimes. Back downstairs Jaime and Jason were washing casks and she asked if I wanted to help. How could I refuse? Now, on a cold Tuesday, moving around wet casks is not particularly fun. My job was to drain the casks, check if they were clean inside, whack them and hammer in the keystone (a rubber plug where the tap gets hammered into). I got wet and I got cold hands. But I’m learning that cold and wet are 2 words that usually describe a brewery. From September to April at least. Paul was finished sparging, and the boil was going when I went back in and he gave me the perfect opportunity to warm up. 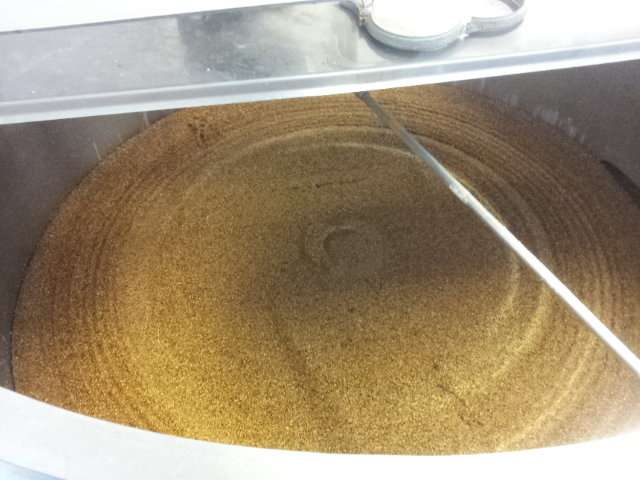 Cleaning out the mash tun. I was handed a big shovel and jumped in. It was hot, steamy and cramped, but that’s part of a brewers job I guess! 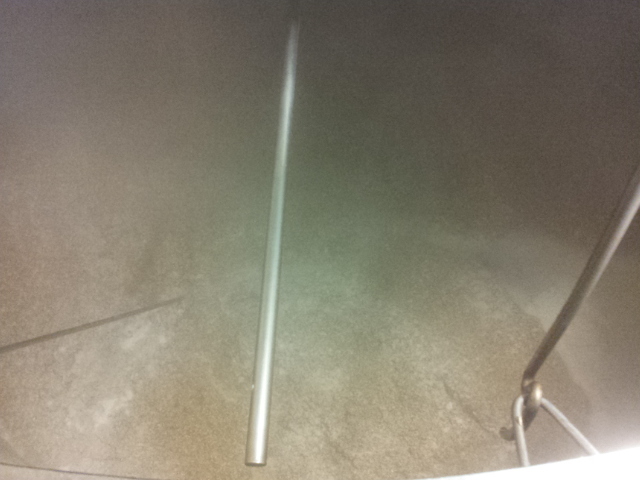 And there’s a lot of water-soaked grain that is left behind when the wort is drained. A lot. But there’ll be some happy cows somewhere. There were some troubles with a pump that slowed the transfer of the boiled wort through the heat exchanger and into the fermenter, so Gary had started to mill his grain and fill the mash tun before Paul was finished with his brew. 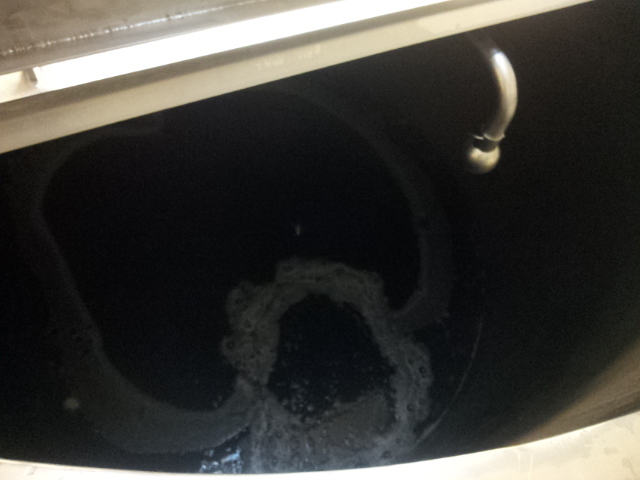 Paul’s wort was eventually emptied out of the boiler and sitting nicely in the fermenter. And in there it stayed until it was joined by Gary’s wort, at which point the yeast would be added. Gary jumped into the boiler to clean out all the spent hops, and I gave him a hand sweeping and bagging all the mess that poured out the bottom of the vessel. 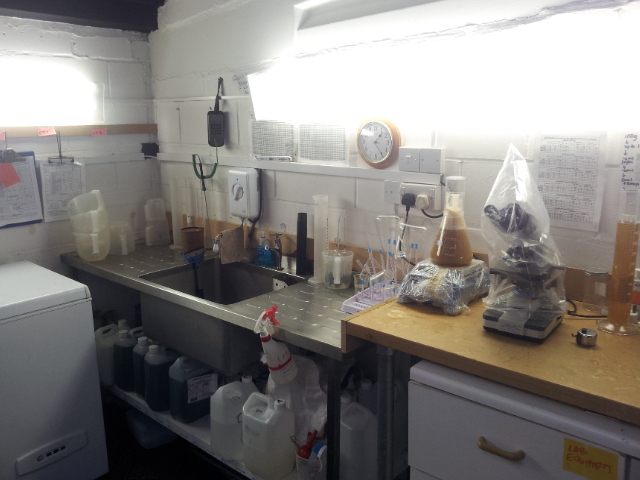 Paul went and took some final readings of the wort from the fermenter and then headed home, job done for the day. Paul has been working at Sambrook’s as a brewer for 2 and a half years. Before that he worked at Young’s and then Hogsback in Surrey. He is a passionate brewer, and clearly gets great pleasure out of his job. He was all set up for his mash, so I left him to it. So, that was the end of my day at Sambrook’s. It’s a very busy, friendly place, full of amiable people that seem in some ways like a family and made me feel very welcome. I very much enjoyed my day there and was craving a Wandle by the time I’d left. And that was also the most work I’d done in a day in a long, long time. It made me realise that brewing is a lot harder work than I had thought. Maybe I’ll stick to the day job, visit breweries and brew at home for friends, family and myself. Oh, and I ached all over the next day. Very interesting & you right, very hard work judging by your report! Would love to visit & taste this beer on my visit to UK later this year!